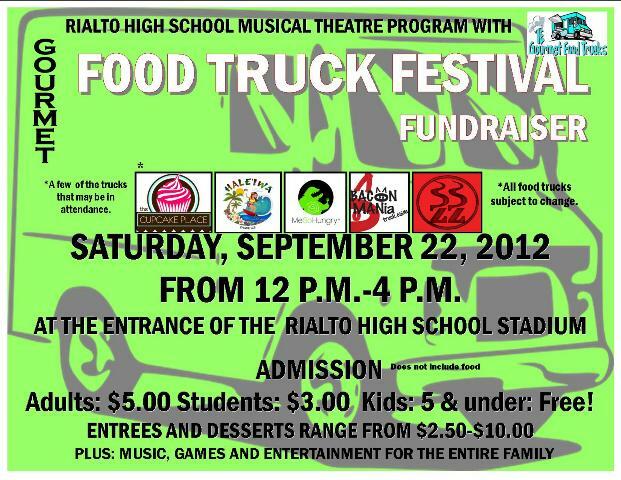 Food Truck enthusiasts and those looking to support High School drama and music programs. Well both people can come together this Saturday at Rialto High School. Our post yesterday was about the food trucks we broke down the types of trucks and what they have to offer. We will have updates on 2 more trucks in the next couple days. So what we have today is………………………… The entertainment!!!!!!!!!!!!!! Car Show — Looking for more cars (classic, racers, concept, newer muscle) Motorcycles, Public Safety Vehicles anything!!!!!!!!!!!! No cost to enter your car!!!!!!! DJ Boogie — Rialto High School Alumni will be spinning and mixing for the crowds. School Choir will be performing. Face Painting — Provided by Marinello Beauty School. Also were looking for cars and vehicles for their car show lets make this a great event. Come back tomorrow for more info on remaining trucks and any other last minute updates.